While most will relate the state of Goa with beaches, liquor and modernity, this beachy haven is in every sense a land of culture, heritage and traditions. Every year, a large number of festivals are celebrated throughout the Goan territory which serve as vital attractions for tourists and locals alike. Let's take a look at some of the most celebrated festivals of Goa. Perhaps the most famous of all festivals, the Carnival is the epitome of celebrations in Goa. It is celebrated for three days and three nights and preceded by the month of Lent (February), this festival brings alive every nook and corner of Goa. Introduced by the Portuguese colonial rule in the 18th century, this festival is that time of the year when the legendary King Momo takes over the operations of the festivals and events. Though introduced by the Portuguese, the Carnival is a part of ancient Rome and Greece which later crept into the culture of Spain and Portugal. Initially, the Carnival had a touch of Portuguese style to it, but with time and India's independence, the festival began to be celebrated in full Goanese style. 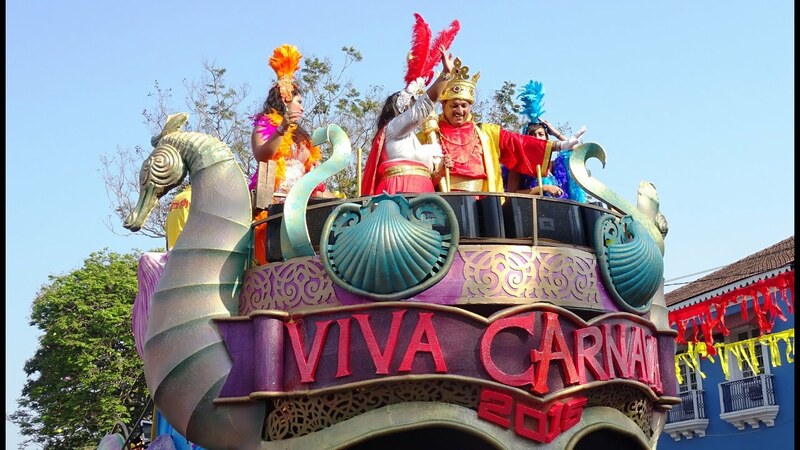 Goa Carnival, the most fun-filled festival in Goa, is meant to be a feast of food, drinks, music, dance and fun - before the 40 day period of fasting and absenteeism of meat in the month of Lent. The days are marked by colourful and musical parades which initiate in the capital Panaji and travel throughout the state making it one of the most popular festivals of Goa. The evenings are kept for gala balls, and people engage in partying on the streets all through the night. The float parade in Panaji is led by King Momo, who floats a specially decorated float to declare the initiation of eating, drinking and partying. The highlight is the final day, on which the celebrations are concluded with the famous black-and-red dance held by the Clube Nacional in the state capital. Though the Carnival was on a decline in the past few years, yet the efforts of Goa Tourism Department and the state government have ensured that not only is the festival revived but also contributes to attracting tourists for the state. The Carnival just cannot be missed. Known for its excellent beaches and legendary nightlife, perhaps Goa is the best place to celebrate Christmas in India. With its Portuguese legacy and Catholic population, Christmas here is celebrated with a gripping fervour. The celebrations, decorations and the carols everywhere an unforgettable ode to the eyes. The best part about Christmas in Goa is the cold evening breeze that gets the friends, families and communities together to celebrate the festival of goodwill and prosperity. The churches and homes are decorated with beautiful lights and poinsettia flowers friends get together for a sumptuous meal. Children sing Christmas carol late into the night and brightening up the lives of every home around. People of all ages line up at the churches to take part in midnight mass. Christmas is very famous in this tropical land and it attracts thousands of tourists from different part of the country and abroad to its shore who come to witness this festival in Goa in all its colours. New Year stands for Party, and Party Stands for Goa. There's no other place in the country which is livelier than Goa. The whole state is indulged in celebrations the entire night. There can be no limit for the level of crazy that this state can put during the New Year's celebration. In spite of the most famous music festivals; Sunburn and Supersonic moved out of the state, the state does not seem to have been affected by it. The celebrations have increased exponentially and the regular party spots like Hill Top, Anjuna, Baga, Palolem, Agonda and all other spots that humans could party in are filled with celebrations. The best part, of course, is the night of New Year when the whole party state stops their thumping Bass and Trance filled music just to count down with the clock to strike the midnight 12. Right at 12, the festivities reach the sky with the fireworks, Champaigns and Music booming in the air with the wooing crowd jumping to every beat. This renowned festival in Goa is carried out to honour the death of Saint Xavier, popularly known as 'Goencho Saib' (Lord of Goa) by locals. He was a tremendous Catholic missionary born in 1507 and came to India with the Portuguese Viceroy of Goa in 1543. His primary task was to preach the religion of Christianity and the Gospel of Jesus to the people of Goa, Spice Islands, Japan and China among other Asian countries. He died on 2nd December 1552, in the Sancian island, about 10 kilometres from the mainland of China. As per popular legend, a group of Portuguese merchants performed his last rites and buried him in a coffin partly filled with unslaked lime. After few months, a Jesuit (member of the Society of Jesus) exhumed the body and was astonished to see that the corpse had not at all decomposed. It was further surprised when he cut a finger from the body and saw blood oozing out. Upon this discovery, Francis Xavier was conferred with the title of 'saint'. The mortal remains of the saint were placed in a silver casket in the Church of Bom Jesus (Basilica de Bom Jesus). However, one hand was cut off from the body- pieces of which were distributed to various parts of the world under the supervision of the Pope. Until 1994, Saint Xavier's body would be brought out every ten years on the anniversary of his death. The corpse would be kept in a glass case with the feet exposed. People from all over India and world would visit the church to worship and catch a glimpse of the saint. After 1994, the body has not been brought for public display since the condition of the corpse had deteriorated significantly. This religious festival of Goa is celebrated for nine days, starting on 3rd or 4th December. During the celebrations, hundreds of devotees from all over the state, the country as well as the world flock Goa to offer their prayers to St. Francis. Huge arrangements of food and drinks are made available to the public, and the park outside the church turns into a picnic spot, with everyone socialising and engaging in various fun activities. Church services begin as early as 4:00 AM and people mark their presence to honour this legendary soul. One of the most popular festivals of Goa is the Three Kings Feast. Organized and enjoyed by Christians and non-Christians alike, this festival is celebrated in the village of Verem in North Goa and Cansaulim, Chandor in South Goa. This feast is dedicated to The Lady of Mount- Virgin Mother Mary with infant Jesus in her lap, who is believed to be the protector of people and is worshipped as the Goddess of fertility. The celebrations take place for nine days and are held in the century-old chapel of Nossa Senhora dos Remidos or Our Lady of Cures. As per legend, a boulder on a nearby hill has two sets of footprint engraved- one of an adult and one of an infant. Also, a depression on a big rock is believed to be the spot where Mother Mary took some rest while the horse on which they travelled drank water. Later, they proceeded to the Hill of Remedies where they resided. Some historians also believe that the chapel where the festival takes place was once a site of a Hindu temple. Hence, this explains the active involvement of Hindus who seek Her blessings and offer their prayers. The festival is celebrated with a lot of enthusiasm and energy, organised by the Vangodds of the Gauncars (indigenous Goans). The idol of Virgin Mother Mary is decorated with flowers, gold jewellery, candles, garlands, incense sticks. The isolated hill on which the chapel is situated finds its significance for this one event throughout the year. A large number of people climb up the steep hill to recite the Rosary for the lady of the blue mantle and attend the mass music dance party are carried out for nine days till the events concluded on January 6 in the Epiphany. The last day of the festival is perhaps the most important. Three boys aged between 8 to 12 from the three villages are chosen to represent The Three Kings. They ride on horsebacks - each on a separate, traditional path called Paz and meet at some distance away from the chapel of our lady of remedies on top of the hill at Cuelim. The boys are dressed as proper royalty in king's robe with jewellery, crowns and gifts of gold frankincense and myrrh. The kings together offer prayer to the lady of the mount and attend a High Mass at 12:00 PM on the hilltop, which is accompanied by sounds of choirs and footsteps in succession. A little boy beating a kettle drum lead the kings who are followed by happy crowd. The Three Kings then place the gifts infant of the Statue of baby Jesus. Music dance and songs accompany the whole ceremony. After the rituals, an elaborate fair is held on the entire hilltops. Fun rides, food, spices, clothes accessories, household items, toys and every other big and small item can be found here. The conclusion of this festival in Goa officially marks the end of Christmas for the state. The Feast of Three Kings is not only a momentous religious occasion but also serves as an excellent tourist attraction. Known for the crazy celebrations, Goa hosts Grape Escapade - The Biggest Wine Festival in the country every year in Panjim. The Annual Grape Escapade witnesses wine connoisseurs from all around the world rushing in to savour the delectable flavours of wine and grapes. This fun-filled festival of Goa is not only famous for its wine but also the cultural extravaganza, gathering in all kinds of tourists. Culinary delights, lots of music, fashion shows, dance and more at the fest are bound to make the visitors happier. The traditional grape stomping, an exclusive wine tasting session and selection of The Grape Escapade Queen are some of the main attractions of the festival. The Festival is organised around the month of April for 4 to 5 days in Panjim. Despite being the smallest state in the country, Goa has an unending variety of rich culinary, culture and heritage. The state doesn't fall behind in showcase these diverse talents. The Goa Food & Culture Festival makes sure that the whole world looks in awe. With the 5-day festival becoming a platform for experienced as well as young and talented chefs to show off their culinary skills to a crowd that includes an audience from all over the world. It's not only the food that's great, the vibe of the festival is great too. The whole arena is cheered up by performances of some great bands. Musicians from the whole country perform for this international audience. What else could make someone happy if not food and entertainment? This fiesta takes place every year in Panjim in April. Make sure you make enough room in your tummy to taste as much as you can. Goan Cashew Fenny is second only to the parties of Goa in popularity and a party in Goa can't be great without the Fenny cocktails. Cashew adds to a decent proportion of the economy of Goa and being a coastal region, coconut is also as significant to the culinary as Cashew is. To indulge in some interesting activities such as Cashew Stomping, Coconut Braking and tasting the most exotic Fenny Cocktails, it is a must to be present in the Goa Cashew & Coconut Festival. This Festival takes place every year in the month of May in Panjim. You'd hate to miss it. 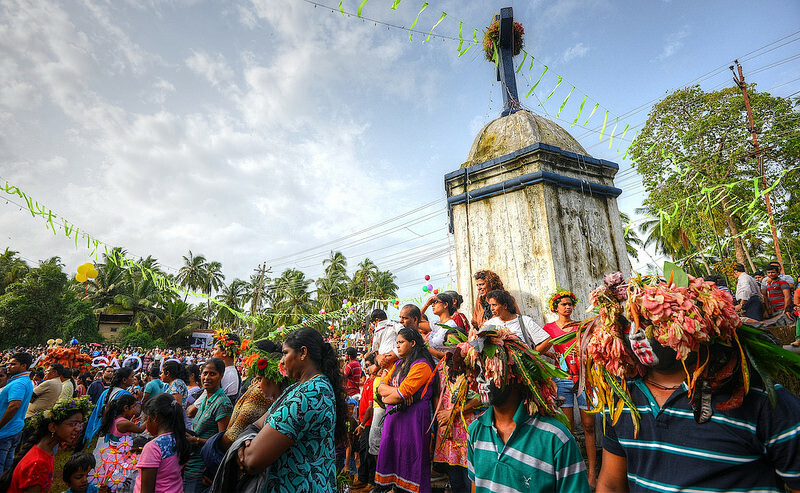 Sao Joao Is one of the most prominent festivals of the Catholic community. Held at the beginning of the monsoon season, this feast honours Saint John the Baptist, the firebrand prophet who baptised Jesus in River Jordan. Like all other festivals in Goa, this festival is also a fun-filled and colourful experience. However, it is celebrated with more pomp and energy in the villages of North Goa. As per the Christian scripture, when Mother Mary broke the news of expecting Jesus to her sister Elizabeth, St. John The Baptist leapt in his mother's (Elizabeth) womb, who was also pregnant. Since then, this festival is also celebrated as the Festival of Fertility. The well into which the youth jump is considered to be a representation of the womb while the leap signifies joy and happiness in Christ's birth. Celebrated on June 24th, Sao Joao is one helluva festival which is as entertaining and pompous as the Carnival. It starts off as a Mass held at the church of St. John the Baptist in the village of Benaulim (north Goa). Then, the youth of Goa do something amazing- get drunk and jump into wells and streams, while singing 'Viva San Joao'. Men and especially young boys visit door to door to ask for fruits and liquor. Another highlight of the day is to watch people parade and singing Mandos on Sanggod - a floating platform in nearby streams made up of two boats or banana trees tied together. This occasion is especially significant for newlyweds and couples with a newborn. They visit the church with gifts, fruits and a bottle of ferns. This festival of Goa is enjoyed by old and young people alike, who sing and dance to the tunes of various musical instruments while getting fully drunk and jumping into wells and streams. Sao Joao is yet another treat to behold for locals and tourists alike. Shigmo or Shishirotsava is a significant festival of the Hindu community in the state of Goa. Sigmo is a Konkani word derived from the Prakrit word Suggimaho and the Sanskrit word Sugrishmaka. This is a spring festival celebrated around March every year. However, since the dates are connected to the Hindu lunar calendar, its dates vary according to the Gregorian calendar. This festival has two variations: Dhakto Shigmo and Vhadlo Shigmo. Dhakto or small Shigmo concerns the farmers the labour class and rural people. Vhado or big Shigmo is celebrated on a much larger scale by people of every class and profession. Welcoming the season of spring, this festival was initiated to honour the homecoming of warriors who left their homes and families to fight the invaders. It is said that a spirit, known as the Gade padap enter the dancers on the final day of the festival. The conclusion is marked by a collective bath taken, known as the Mand davarap. The Shigmo festival of Goa is in every essence a Hindu version of a carnival and is a variation of the Holi festival. The celebrations see a mesmerising side of Goa like no other. The entire state is drenched in a sea of colours and parties on a massive scale. Shigmo typically displays folk dances, street plays and magnificently built floats that depict scenes from the local and Hindu mythology. People play a vast number of musical instrument like flutes, dhols, drums, trumpets, etc. 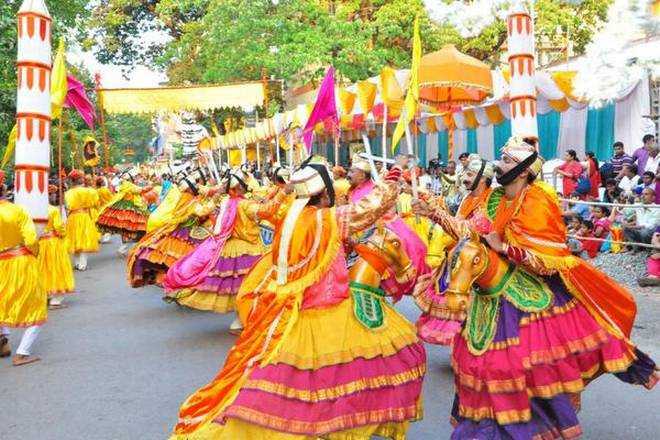 Both music and folk dances form a part of the grand parade which begins at Ponda and proceeds to other places of Goa in the next few days. While Dhakto Shigmo is dedicated mainly to folk dances and songs, Vhadlo Sigmo is celebrated in the village temple. Both of these are celebrated in separate temples on separate dates around the same time period. The village God is first bathed and then dressed in a saffron robe on the first day of Shigmo. A feast is held, after offering food to the deity. The celebrations are held for a fortnight, with each day dedicated to a different area. People place money in a plate carried by the performers, and in response, the performers sing a song - Tali to wish the wellbeing of the donor. The enactment of various mythological scenes and a variety of folk dances are an essential highlight of the festival. Every year thousands of tourists, as well as locals, come to be a part of this awe-striking amalgamation of plays, music, dance and lights. Vasco immerses in the festivities of a hundred-year-old festival of Vasco Saptah during the holy month of Shravan. The festival has a really fascinating story and the story is such that in 1896 when people began dying due to an epidemic that broke out in Vasco, the local turned to an avatar of Shiva, Lord Damodar for help. A sacred coconut, which was installed at Vasco as a divine symbol to be worshipped, was brought from the famous Damodar Temple at Zambaulim (22km from Margao). The epidemic abated as their devotion bore fruit. The residence of a leading citizen was donated to install an idol of Lord Damodar. Even now, this small temple attached to the original house is the main venue during the celebration. Indulge in the Vasco Saptah to understand the culture and heritage of goa in a totally different way. Goa is also a land full of temples and churches and can surprise you in an all-new way. Celebrated on the fourth Saturday in August, this festival takes place on the quite, little island called Divar (12 km from Panaji). During this time, this small island comes alive with people, music, dance and feasts. Interestingly, the Bonderam Festival has a unique story associated with its celebrations. Many years ago, the villagers resisted against the Portuguese rule of demarcating areas by putting up flags, to mark areas that could not be taken up by people of nearby villages. The inhabitants had protested by knocking down all the flags. Since then, this festival began to be celebrated as a tribute to those protests and protestors. Every small community or group of people celebrate this festival in Goa by creating colourful tableaux and embarking on massive parades throughout. Extensive feasting takes place and almost every household is decorated, thus presenting a scenic atmosphere. A very interesting activity during this festival is the mock fights that take place between rival groups, thus resembling the knocking down of flags. Toy weapons made of bamboos and wild berries are used as tools and missiles, respectively. The villagers engage in these cheerful and funny fights, after which they come together to eat, drink and party. The Bonderam is yet another attraction of Goa and its festivals. Goa is home to a lot many festivals, apart from the names mentioned above. Religious festivals like Christmas, Diwali, EId-Ul- Fitr, Ganesh Chaturthi, etc. are also celebrated by the respective religions. 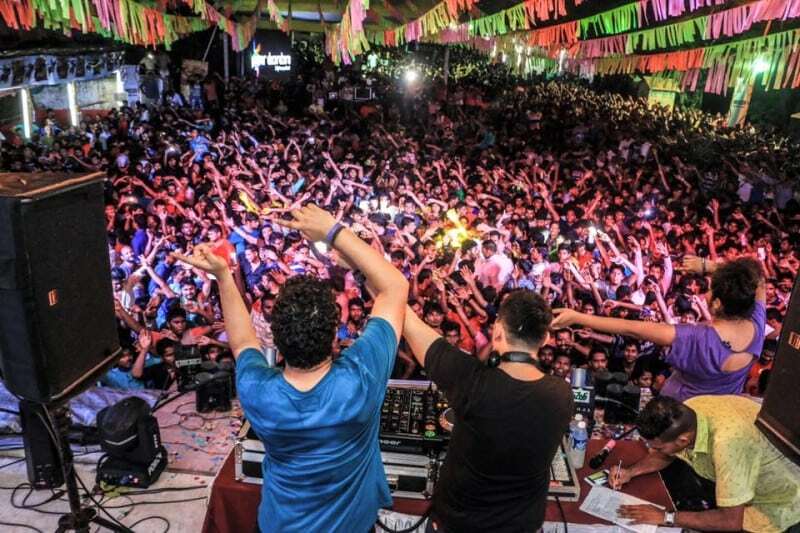 Another famous attraction of Goa are the numerous music festivals which take place throughout the year. Visiting Goa during a festival is a remarkable experience that should not be missed.